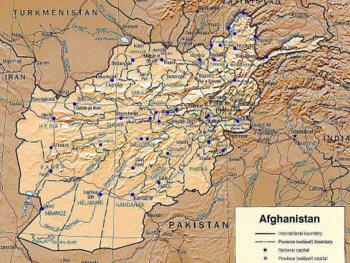 Need an Afghanistan map? There are several reliable websites producing high quality maps. AIMS, Relief Web, and the University of Texas, not to mention Google are several resources for quality maps. Here we are compiling the best maps for newcomers from several of these resources. If there is a specific map you need, let us know and we will track it down for you and include it here. Use this map when you need to know which districts have rockets falling in them when you get those security reports. Kabul City Center is a landmark in the city - all directions tend to utilize this building as a focal point. If you know where the KCC is, you can get directions to pretty much anywhere in downtown - "Toilet Street," "Butcher Street," "Chicken Street," and other unique names used by foreigners to figure it all out. Has your NGO or business come up with a better map? Pay it Forward by sending it to me so I can upload it here. This map shows a blue dot everywhere there is an airstrip accessable by at least a single engine Cessna. There are at least thirty airstrips managed by the villages in which they are located. It's important to know which districts are which, especially when the security reports come out. Expatriates need to know which areas or "danger" zones. Pay close attention to district numbers, and learn the boundaries of the city you live in for each of these districts which impact you. There are many ethnic and linguistic groups in Afghanistan. Each have subtle differences. If anyone portrays themselves as "experts on Afghanistan culture" consider carefully which ethnic group they have the most experience in...this tends to "color" their interpretation of every other culture group.